Joining the Church this Easter or just going through your first Lent as a Catholic? Or maybe you’re getting serious about your faith again after many years away. Congratulations on all counts! Lent is the perfect time to dive in and really get to know your faith and to begin to root out any unholiness that has crept into your life. What to give up? Probably the first thing you associate with Lent is giving something up. We do this for many reasons including reminding ourselves that we are more than just a body and need not be slaves to its every earthly whim. It helps develop self-control, and also, dare we say, creates some discomfort, and we can offer that up in union with Christ’s suffering to have redemptive benefits (to help others in some way). MY favorite reason to give up something is to begin to change bad habits that lead to sin — or are sinful. Look for something in your life you’ve gotten too attached to, that creates a habitual pleasure, pride or reveals an attachment to money. Start rooting that out by giving it up for Lent. Here’s a quiz that can also help you decide what to give up. Remember to add something – Lest we get all focused on the bad, let’s remember to add something holy to our lives this Lent. 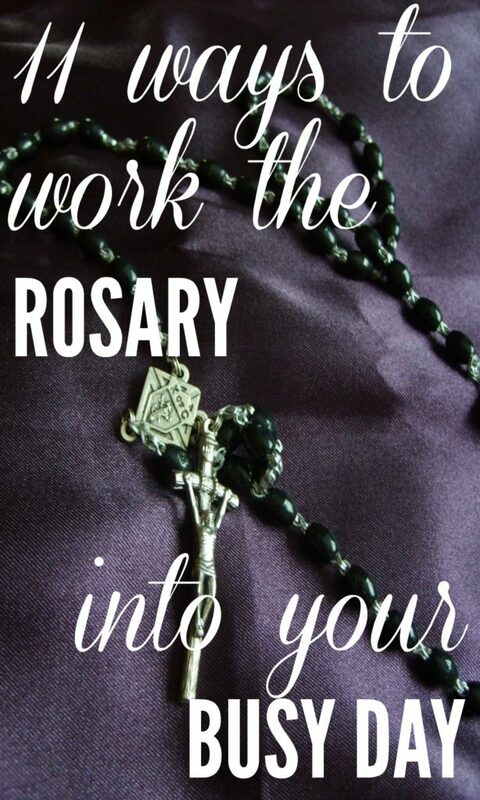 Can you spend 15 minutes in quiet daily, pray the rosary every day, attend daily mass once a week, go to confession more than once, finish a Catholic book, do an act of mercy weekly, read the Church’s daily Bible verses? Surviving the fast – Yes, as a Catholic, you are now required to fast on Ash Wednesday and Good Friday (that means one regular meal and two small meals that add up to no more than one regular meal) and abstain from meat each Friday during Lent. This is a tough one, as we don’t like to be hungry (see my blog on the benefits of fasting)! The Lenten Mercy Challenge, created by MyConsecration.org (which promotes Total Consecration to Jesus through Mary) is offering help by asking you to simply fast on bread and water for lunch each Lenten Friday, along with praying just one decade of the rosary for a special intention. They hope all of us doing this in solidarity will help cause God’s Divine Mercy to be poured out on the world, which is so in need of it! Get help being accountable for your prayer and fasting in their Facebook group. You can also watch my story of how prayer paired with fasting brought about a blessing in my life. Take advantage of your parish offerings – Lent has brought about many blessings in my life and it was because I put myself out there and attended services and events offered at my parish. For example, a wonderful Lenten speaker, Hector Molina, greatly inspired me last year and helped me break the ice in getting to know my fellow parishioners. I love going to Stations of the Cross on Fridays, our parish’s fish fries, all the services during Holy Week and I take off Good Friday entirely to basically spend my day in worship and prayer. It will do wonders for you spiritually. Don’t overdo it – All that said, don’t overdo it or you will fail on your intentions and get discouraged. Focus on 1 thing to root out, 1 thing to add, make sure you’re fasting/abstaining, get thyself to confession at least once and attend what you can at your parish. Ok, that still sounds like a lot… 🙂 If you do mess up, don’t let that stop you from going further. Just get right back in the game. We all fail and sin and that’s why God provides us with His neverending mercy. He’s cheering you on to succeed! 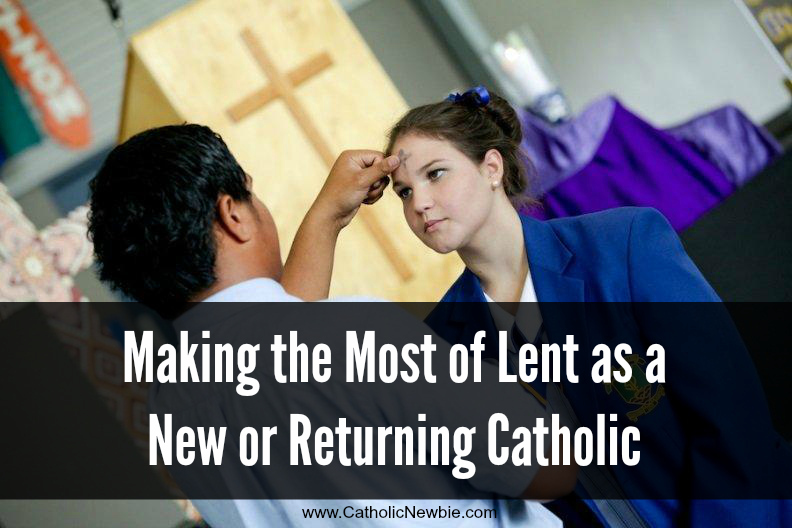 What tips do you have for those new or coming back to Catholicism for Lent? 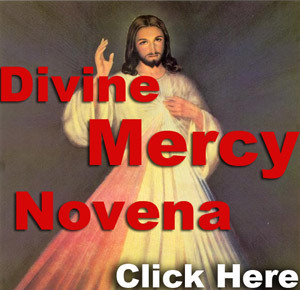 One of my favorite free Catholic services, PrayMoreNovenas.com, is starting the Divine Mercy Novena leading up to the Canonization of Pope John Paul II and Pope John XXIII. It starts on Good Friday and will be a great way to finish Lent strong! The way it works is that you simply sign up to receive a daily email during the novena with the prayer for the day and any special intentions. Of course, you can add your own intentions, as well. I really enjoy it because it’s a daily reminder for me to pray the novena, as I’m sure I’m not the only one who starts one and then forgets one day in the middle and feels like I have to start all over :). For more information or to sign up, visit their website. Hope you join me! As I hear Pope Francis exhort over and over how important it is as Catholics and Christians that we get out on the fringes of society and be with those who need help or a kind word or just human interaction, I see more and more how this is an area in which I am lacking. We are measured not just by what we do, but what we don’t do. Ignoring that person on the side of the road whose tire is blown may be just as much of a sin as actually speaking an unkind word. But in my mind I think how in the world am I going to add in time for such volunteer work? I’m already running a full-time (probably MORE than full time) business, serving as mom to two elementary-school age boys, trying to be a good wife to my husband and, of course, make time for mass (often daily), adoration, prayer, blog writing, a daily rosary… you get the idea :). How do I work in one more thing? Well, I received a review copy of this wonderful book recently that provides a wonderful solution. 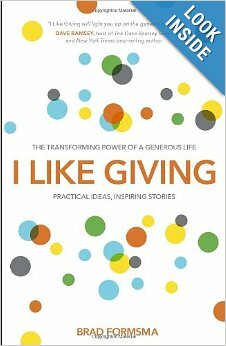 In “I Like Giving,” author Brad Formsma suggests that instead of making giving a once a month, or one-off, task, change to a lifestyle of giving. And what I liked best of all about this book is that giving doesn’t need to be a big act of generosity that drains the funds of someone already struggling or takes up a day of your time, though it can, of course, if you choose. But rather, giving can be the smallest act of kindness that takes no more than a second but requires a spirit of generosity. One of my favorite parts of the book is that it is filled with stories of giving from everyday individuals like you and I. 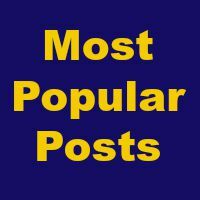 These serve as a wonderful repository of ideas and inspiration for all manner of generosity — from buying a house for someone so they never have to worry about rent again to cleaning out someone’s car for them without ever mentioning it. I’ve already come up with several creative ideas to make someone’s day without them expecting it. What joy that gives me to see the joy in them! Formsma also gives tips along the way about things like when someone rejects a gift, when someone squanders a gift, whether or not to give gifts anonymously, how to look for giving opportunities and more. He also shares stories and statistics on how giving has affected the lives of so many from increasing happiness to changing someone’s entire outlook on life. I don’t think Pope Francis could have said it better himself :). Go to ILikeGiving.com for stories of giving and to start changing your lifestyle this Lent.